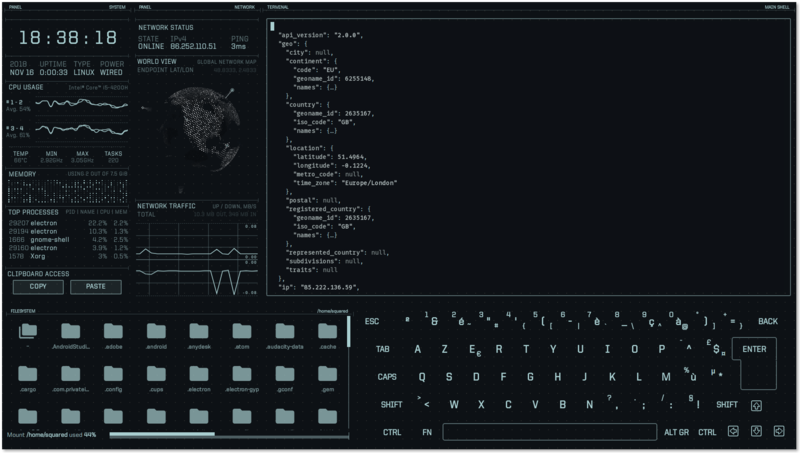 Squared (AKA Gaby) is a French hacker who created edex-ui, a science-fiction inspired desktop "heavily inspired from DEX-UI and the TRON Legacy movie effects," which gives you a terminal and live telemetry from your system; it looks like it would be especially fun on a tablet (though if you really wanna go sci fi, build a homebrew cyberspace deck). I had no ideas for a name so i took DEX-UI and added a "e" for Electron. Deal with it.